Graham started by introducing the members to The Institution of Engineering and Technology. The IET is one of the world’s largest engineering institutions with over 168,000 members in 150 countries. It is also the most multidisciplinary – to reflect the increasingly diverse nature of engineering in the 21st century. The current Royal Charter and Bye-laws of the IET came into effect from 1 October 2016. Graham was one of 7 members of the Biological Effects Policy Advisory Group within the IET whose task was to determine if there are harmful biological effects of low-level electromagnetic fields at frequencies up to 300 GHz. It was explained that possible dangerous EMFs depend on frequency, magnetic and electric fields, exposure time and distance from the source. While high levels can be problematic, it was shown that for the most part, power levels used in British Amateur Radio are not harmful if precautions are taken. Based on the FCC bulletin OET65, a safe distance (in Feet) from a Horizontal half-wave dipole wire antenna with a transmitted power of 100W at 3.5MHz is 2 ft., at 7MHz, 3.5 ft, at 14MHz, 7 ft, at 21MHz, 11ft and at 28MHz, 14 ft. 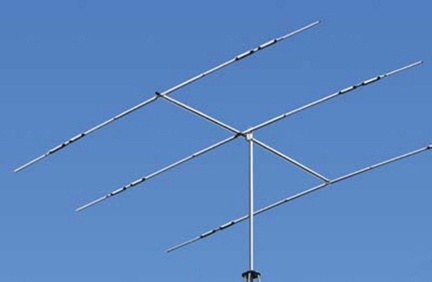 In use these wire antennas are usually as high as possible and nearly always at 25ft or more. At 400W the safe distance from a wire dipole is equal, in feet, to the frequency is MHz. I.E. at 28MHz: 30ft. Safe distances from a triband Yagi can be more. These figures do not apply to magnetic loops etc. which can have significantly higher fields depending on frequency and power used. It is recommended the loops are not used in the shack or indoors for transmissions.